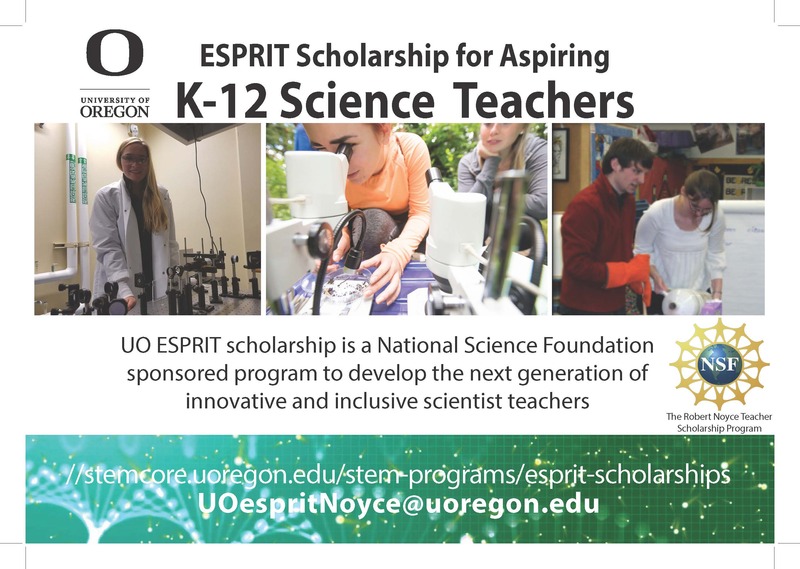 The University of Oregon ESPRIT Program is designed to recruit, prepare, and support UO science majors for K-12 science teaching careers in high need school districts. The program addresses the need for highly qualified science teachers by supporting a summer science research experience, coursework in promoting equity and diversity in schools, and teacher community-building activities. ESPRIT is supported by the National Science Foundation’s Robert Noyce Teacher Scholarship Program by a 5-year $1.2 million award. 1) Academic year ESPRIT Innovative Science Teaching Explorations, open to all science majors, featuring teacher guests and designed to model, explore, and discuss exemplary science classroom lessons in order to build and support a community interested in science teaching. This is the first step on the ESPRIT pathway, and participating students will be given priority when applying for #2 and #3 below. 4) UOTeach ESPRIT scholarship* of up to $22,000, to complete their teacher licensure. *Scholarships recipients will have up to 7 years after receiving licensure to teach 4 years (2 years per level scholarship) in a high need school district, or the scholarship becomes a loan. This is a feature of the NSF Noyce program. ESPRIT participants take Education Studies (EDST 420 and others) courses while undergraduates that focus on teaching to improve equity and inclusion in science classrooms. These courses will count towards the UOTeach requirements when they enter that program. Interested students should contact STEM CORE Coordinator Julia McMorran at uoespritnoyce@uoregon.edu. Read about ESPRIT Scholarship recipients. A signing ceremony to recognize and celebrate our latest ESPRIT Scholarship recipients was held Tuesday, November 6th. Link to the ESPRIT summer research application. We are currently accepting applications for Summer 2019 through April 19th. Applicants do not need to have previous research experience in order to apply. The ESPRIT senior-year scholarship application is now closed. Students participating in summer research and attending ESPRIT seminars who are entering their senior year in the 2019-20 school year will be invited to apply, as well as students who have already completed an ESPRIT-sponsored summer research experience. The deadline will be in early September 2019. A link to the senior-year scholarship application will be posted here.